Janos Starker plays a jazz suite for cello and 17 percussion instruments accompanied by George Gaber. The pieces feature portraits of Jazz legends such as Miles, Dizzy, Duke and Trane among others. The sessions were recorded directly to 2-track analog tape in 1980 at the University of Indiana Opera House which is noted for its fine acoustics. 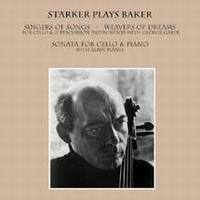 Also included is the Sonata for Cello and Piano written by David Baker with Alain Planes accompanying Starker on piano. This is a purist audiophile recording with one of the 20th century's best cellists' - a treat not to be missed.